Founded by Englishman George Milburn and once the largest manufacturer of its kind in the world, the Toledo, Ohio based Milburn Wagon Company diversified into motor car manufacture during autumn 1914. However, unlike most rivals it chose the electric motor rather than the internal combustion engine as a means of propulsion. 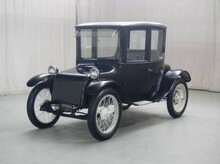 Conceived by Karl Probst, who would go on to design the Bantam Jeep, the first Milburn Light Electric cars could be had in either Model 15 Coupe ($1,485) or Model 151 Roadster ($1,285) guises. Though, both shared the same 100-inch wheelbase ladder-frame chassis equipped with all-round leaf-sprung suspension (semi-elliptic front / cantilever rear) and two-wheel mechanical brakes.